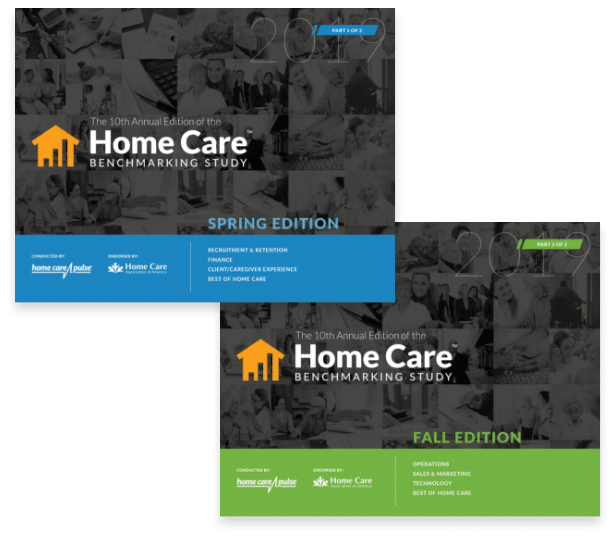 Save $100 on your pre-order of the 2019 Home Care Benchmarking Study Bundle (Spring & Fall Edition) with discount code PREORDER19! The Prep Worksheet will help you prepare your survey responses and complete the online survey in about 30 minutes. Get the 2018 Home Care Benchmarking Study! What is in the Benchmarking Study? Keep up to date with trends in the home care industry; recruitment, marketing, finance, turnover, sales—it’s all here. Learn from the experts. Each section of the study features exclusive articles with powerful insights and strategies. Get the turnover and recruitment data you need to make informed decisions and fight the recruitment crisis. Access industry benchmarks and see how you stack up to the competition from a finance perspective. See what data from tens of thousands of client and caregiver surveys performed by Home Care Pulse say about satisfaction. See which agencies earned a Best of Home Care – Provider of Choice, Employer of Choice, or Leader in Excellence award. The Operations section provides information about client turnover rates, lifetime value of clients, and more. Find out what strategies are working for agencies across the country, see what sets them apart, and discover where to focus your efforts. New for 2019, see how agencies are leveraging technology to grow and solve problems as home care evolves. What’s New with the 2019 Study? For 2019, we’re splitting the study into two editions. The Spring edition will be released in May and the Fall edition will arrive in September. This change will help you get relevant data on the industry throughout the year and give you more options for purchasing the study. Using the latest survey data alongside data from our past seven studies, we’ve identified key industry threats and trends. Track the changes by year and compare your company to industry standards in finances, marketing, recruitment, and more. Discover the top 10 referral marketing sources by percentage of revenue and learn about the top referral sources for agencies who are leading the home care industry. Get detailed insight on finance trends for the home care industry including median weekly billable hours for live-in care and hourly care, as well as billing rates, median revenue, profit & loss, and many more. Review operational insights including client turnover rates for the industry, regional turnover, readmission rates, average length of service, average lifetime value, and more. What benchmarks are included in the study? Order the 2018 Home Care Benchmarking Study! More than 700 participants from North America. Download now for just $349. comprehensive study on the industry. pages of graphs & info. Why do we publish the annual study? At Home Care Pulse, our mission is to provide information that facilitates the success of your home care business, and ultimately helps you improve your quality of care. We provide detailed client and caregiver feedback reports through our Satisfaction Management Program and industry analysis through the annual Home Care Benchmarking Study. These resources help you manage your business more effectively and make critical decisions. As you use this data to inform your business decisions, the study will change the way you think about and the way you run your company. Whether you’re new to home care or seasoned, the study will be an invaluable resource for making well-informed decisions and improving your quality of care.